On the Saturday 10th October, as part of Reclaim Power, an international day of action, members of Birmingham Friends of the Earth were accompanied by Birmingham Green Party and many other campaign groups which gathered on New Street, dressed in black, to lead a funeral procession up to the city council on Victoria Square. This raised awareness of how seven counties in the West Midlands have workers’ pension funds invested in large fossil fuel companies like BP and Shell, totalling at £355 million. This includes Birmingham, Wolverhampton, Solihull, Coventry, Dudley, Sandwell and Walsall. 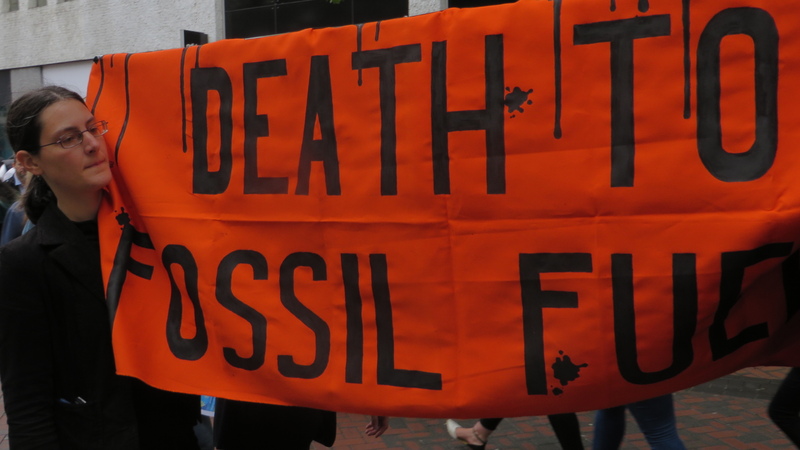 Campaigners at the march carried a coffin draped in banners which read: “Divest Our Pensions” and “Death to Fossil Fuels” catching the attention of thousands of shoppers passing by. During the demonstration leaflets were distributed with information about the damaging impacts of using fossil fuels on the atmosphere and how using sustainable energy can offer a solution to the threat of climate change. Specific to the issue of divestment, the leaflets handed out also explained why, as it becomes cheaper to use cleaner sources of energy, fossil fuels are becoming more of an unsustainable investment, ethically and financially. Research shows that 80% of known fossil fuels need to be kept in the ground if we are to avoid irreversible and catastrophic levels of global warming. 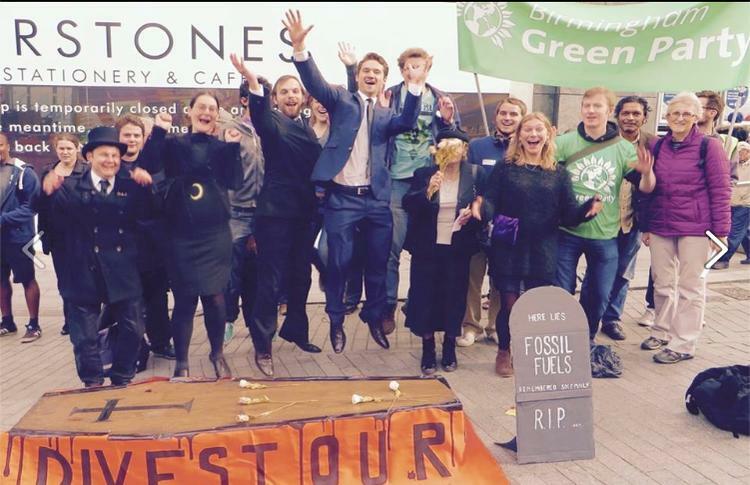 Therefore, it is imperative that the West Midlands should follow the example set by Oxford City Council and Bristol City Council and divest from fossil fuels. To add to the simulation of a real funeral, rose petals were scattered along the road and flowers were held by “mourners” in the march. 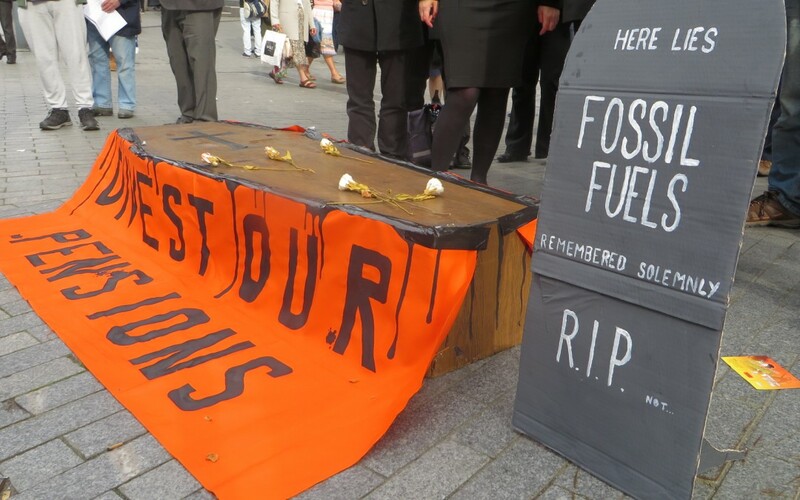 As the procession arrived at the city council on Victoria Square, a headstone was placed beside the coffin which read “Here Lies Fossil Fuels, Remembered Solemnly, R.I.P. 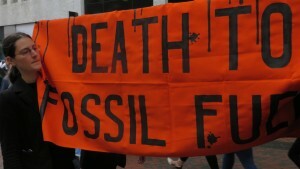 … NOT…”, and a eulogy for fossil fuels was read by one of the Friends of the Earth members. Once the funeral had finished, the atmosphere of the gathering was lifted into a party, with confetti and bubbles blown into the air, as more passers by were encouraged to sign a petition. This was a great demonstration that will hopefully show that the people of the West Midlands care about taking their money out of fossil fuels and joining a global mobilisation of local governments and businesses that has so far taken $2.6 trillion away from this industry.